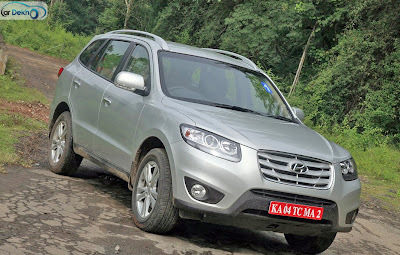 Hyundai Motors India has launched the most awaited SUV in India, 'Hyundai Santa Fe' today. The new car is available in 7 seater version with powerful 2.2-litre CRDi engine. It will be available in India as a CBU (Completely Built Unit from Korea), wherein only 300 cars would be imported in the first phase. The new car has been developed with diesel engine, which was already expected that this product of Hyundai will be available in Diesel engine only. This fuel supply system - CRDI provides surprisingly nice engine performance along with a much better fuel efficiency. The new Hyundai Santa Fe is available in two versions which include the 6 Speed Automatic Transmission and the 6 Speed Manual Transmission. 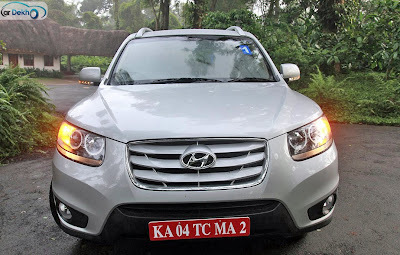 Hyundai Santa Fe Euro V engine has also got four cylinders and sixteen valves along with Double Over Head Camshafts (DOHC) which provides better torque and clear and clean emission. This 2.2 L engine is available in 2 versions such as the 4X2 (two wheel drive) version that has been priced at Rs. 20.95 lakh and the 4x4 (four wheel drive) version priced at Rs. 22.95 lakh (ex-showroom, New Delhi). The all powerful 2190cc 4 cylinder CRDI engine has got an excellent capabilities to deliver 197PS of peak power @ 3800 rpm and hits out 420Nm of torque between 1800-2500 rpm (there is also a 3.5litre V6 280PS that sells in some regions). The new Hyundai Santa Fe has been designed with wonderful exteriors and the impressive interiors features which provide comfort as well as style are sure to captivate the attention of many. The model has got many advanced features, for instance, this mid size SUV is now equipped with body moldings and new bumpers, a new grille and sporty wheels. All these features provide a sleek look to the product. According to the new car builder, a pair of fog lights in this model provide a taut and dynamic stance. The radiator grille provided in the front bears the company’s logo. Features like Electric front/rear windows, One touch facility on driver's window, Tinted glass, Variable front intermittent wipers and Rear Windscreen wiper defogger are sure to give a elegant view to all the on lookers. The interiors of Hyundai Santa Fe are quite impressive with the combination of cloth and leather seating surfaces. 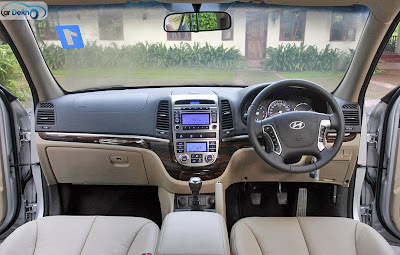 Some of the most interesting interior features include Dual zone climate control, Humidity sensor, Ashtray and cigar lighter, Front and rear cup holders, Front and rear door pockets, Front armrest/storage, Height/reach adjustable steering column, Leather gear knob, Leather steering wheel, Leather upholstery, Lockable glovebox, Luggage hooks etc.The Hyundai Santa Fe is available for booking with an initial 5 percent booking amount to be paid at the dealer outlets.